Winning is the flavour of the IPL 2018 season. Simply use VIVO IPL and Perfect Fan in your conversations around VIVO IPL and you stand a chance to win Match Tickets or Vivo smartphones.Simple, right? Let's get it started then! MaalFreeKaa.in is Best From Others Site? Our Team Try to Share Best Freebie Deal and Online Contest with Guidelines and Post Confirm Before Publish No. 1 Online Contest & Free Sample Website. You Can Find All Online Contest And Freebie Deal only here. Want To Free IPL 2018 Ticket?, T-Shirt, Merchandise, Official Jerseys and much more only get here because we are share all T20 IPL 2018 Contest. Vivo India will select few lucky winners from all the entries received. Winners would be entitled to receive Free Match day Tickets for VIVO IPL Matches. Winners will be contacted by Vivo India representative via email/social. 1. 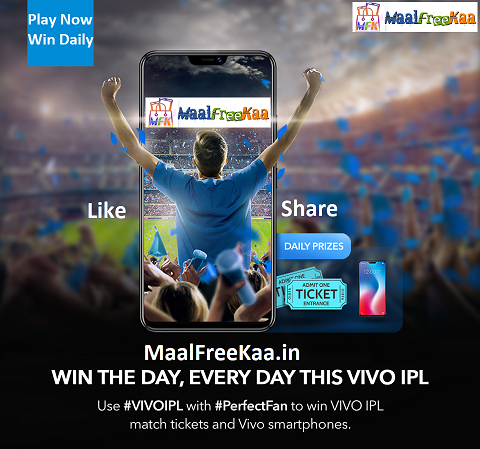 Mention #VIVOIPL and #PerfectFan in your conversations / tweets around IPL (Post/ GIF/ Videos/ statuses etc - on your timeline/ Team pages/ VIVO IPL franchises’ handles/ VIVO IPL Player’s social handles etc ), anywhere on Facebook, Instagram or Twitter . 7. The winners would be announced every day.